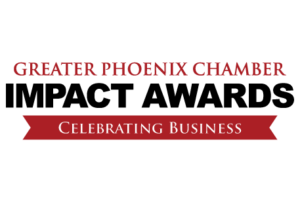 Every year, as a core component of the Greater Phoenix Chamber’s IMPACT Awards, the Chamber honors two businesses as Economic Drivers. For the IMPACT Awards, the Chamber defines an Economic Driver as a business or organization substantially contributing to the economic vitality of the Greater Phoenix community by creating new jobs and opportunities, advancing a new industry or revitalizing a business sector or neighborhood. This year, two companies—one with 250 or fewer employers and one with more than 250 employees— were named Economic Drivers at the IMPACT Awards luncheon. Plaza Companies (250 or fewer employees) and the Phoenix Suns (250 or more employees) are this year’s Economic Drivers, and for obvious reasons, both organizations are truly helping businesses and organizations around them grow and flourish. With offices in Peoria, Scottsdale, and Tucson, Plaza Companies is a full-service real estate firm specializing in the management, leasing, and development of medical office and commercial office properties, technology and bioscience facilities, mixed-use properties, and senior housing communities. Since 1982, Plaza Companies established a proud track record as a competitive, connected and conscientious real estate firm with partnerships throughout the industries it serves. The company owns, provides leasing services or manages more than 10 million square feet, through partnerships and relationships with physicians, hospitals, financial institutios, REITs and private equity investors. Established in 1968, and celebrating its 50th season this year, the Phoenix Suns were the first professional sports team in Phoenix. The mission of the Phoenix Suns is “to provide the finest in sports, entertainment and community leadership.” The Suns organization has not only created new jobs within the team organization, but has created four additional new businesses of its own while growing its workforce substantially. More importantly, they played a leading role in convincing others in the professional sports industry that Phoenix can be a legitimate sports hub, driving economic success for the region from many areas.